Containing quality ingredients, this Monin 750 mL premium cranberry flavoring syrup is a quick and easy way to add new flavors to a variety of recipes! Add a splash of this cranberry syrup to your most popular beverages and it's sure to please your guests. The fresh, berry taste and dark red color of this flavoring syrup will enhance the fruity profile of your mixed or blended drinks without overpowering them or being too sweet. Plus, it's produced with pure cane sugar and no artificial flavors, making it an all-natural syrup with a balanced blend of flavor and aroma that will instantly upgrade your margaritas, teas, and lemonades. Since 1912, Monin has had a passion for delivering premium products that simplify the beverage-making process. Their sense of innovation and creativity has led to a wide variety of flavors and recipes to suit any menu. Use this Monin cranberry syrup and craft superior beverages for your guests! This such a great flavor for making cocktails. I make a cranberry soda with vodka it it is really good. The awesome cranberry flavor in this syrup deserves the credit. This cranberry flavor has become a customer favorite at our shop. I bought it to mix with the almond but start mixing it with lemon slushies and lemon flavoring in Italian sodas. The cranberry flavoring syrup is terrific and very fresh and tasty. A great way to make delicious sweet and tart cocktails everyone enjoys. Great syrup from Monin. I have always loved cranberry syrups. I have used this syrup with so many different things including our drinks that we prepare at our bar and in some ice cream. It is so good! Sweet, tart, smooth. Really accurate flavor profile and mixes well with other flavors. We have not tried this with milk product and probably will not, so unsure if it will curdle but great for cold refreshers or in tea! My favorite fruit flavoring syrup from Monin. i love the cranberry sprite zero but it is only available for a few months in store. So glad I can make my own year round with this great tasting syrup. I was actually surprised at how quickly we went through this bottle of cranberry flavoring syrup. It tasted a lot better than we had expected it to. The premium cranberry fruit syrup is a great option for making some wonderful Thanksgiving drinks. The cranberry syrup is tart and sweet and one we will use for many years to come. Everyone loved the great flavor and taste. Not the best taste- however it is a syrup. We used it in a cake to enhance the flavor of a cosmo flavored cake. It did the job. However we wouldn’t reorder right away. The monin premium cranberry flavoring is perfect for spicing up cocktails. It has a great tangy cranberry flavor and makes really good cosmopolitans. Great for festive holiday drinks. If your a cosmo lover, this is a great syrup. It’s very concentrated and has a tart flavor that’s distinctly cranberry. Add a splash of lime juice and you’ve got a delicious drink. Like all Monin syrups, this makes a fabulous soda. I like 1oz of syrup in 12-14oz of seltzer. Very refreshing on a warm day. 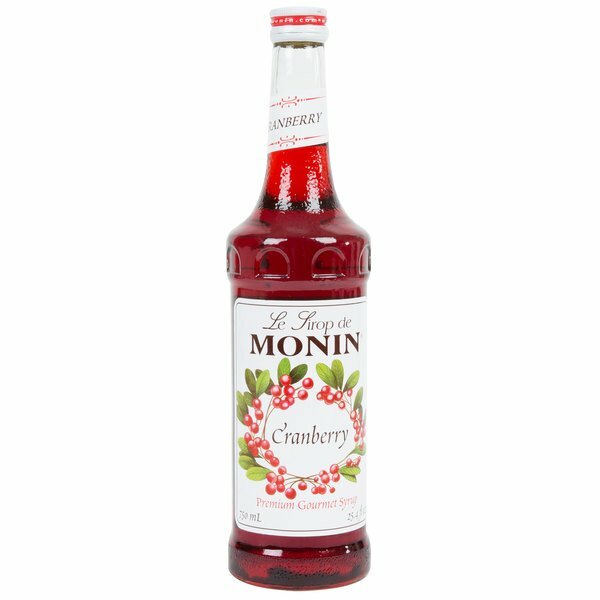 Cranberry Monin syrup has a rich and perfect flavor for your mock-tail cocktail, tea or soda. Cherry Monin syrup is the right choice for you because it gives a perfect sweetness and true flavor for your mixed drinks. This flavoring syrup is a must when the fall season rolls around. Perfect for making cranberry limeades or lemonades. It also great for making holiday inspired cocktails. Cranberry flavoring becomes more popular during the fall season. It is though good all year and especially when combined with apple flavors. This makes a good cran-apple fizz.